Yep, it’s official; I now have three children at school! I honestly didn’t really feel too sad with her starting, mostly just happy that she was so looking forward to going, and of course deliriously excited there is now one central drop off and pick up point. She has loved it, although we hit a wall of exhaustion last night. It took me an hour and a half to get her to sleep, and I sang my entire repertoire of soft, melodic songs. I particularly like U2’s “Running to Stand Still” for this kind of thing. Only when I was half way through I realised I was actually singing about a drug addict’s slow and painful demise. I don’t really ever do this anymore, but I had to bank a cheque. I was very pleased to discover I didn’t have to fill in those small, rectangular, complicated forms you used to have to fill in (did ANYONE know what numbers were supposed to go where?) so it was very fast. One odd thing is that now banks have gone all customer friendly, there’s couches everywhere and it’s a bit hard to know where you’re supposed to line up. You think you’re just sitting down to wait and you find you’ve unwittingly applied for a business loan. Unfortunately, I suffered the consequences of wearing my contact lenses too much over the holidays and my right eye rebelled. I got worried and went to the eye hospital where there was a four-hour wait! It was all Ok in the end but I had to take very good care of my eye for a few days. It was like having a newborn again – I had to bathe it and rest it and not get it overstimulated. For a long time I held off on extracurricular activities. But now they have become a full-blown part of our lives. Bookworm does tennis and science club, Picasso does tennis and piano, and Little Miss does ballet and acrobatics. I devised an intricately detailed rotating fortnightly plan of who drops off and who picks up and where everyone has to be and what they have to remember, and WE DIDN’T STUFF IT UP. Yet. As my colleague would say, no one got left at the side of the road, so it was all a huge success. I don’t know what century they are living in, but it sure was weird. So! Onwards and upwards for the rest of the school term now. While there are many significant moments in life which are obviously life changing, I find that often it’s the little things that make all the difference. You know – they’re the small day-to-day happenings that have a disproportionate affect on your day, your mood, and thus the world and life in general. So I thought I’d share a couple of these small yet powerful events that have shaped my week thus far. On my way driving Bookworm and Picasso to school on Mufti Day, I had a horrible sinking feeling as realised I didn’t have any gold coins. Just as I was about to scour the car for coinage and send them off with several handfuls of 5 cent pieces – I found two shiny gold coins in the hidden zipper pocket of my handbag! I had literally struck gold! Happy days were here again and my joy over this seemingly insignificant event was indeed exponential. 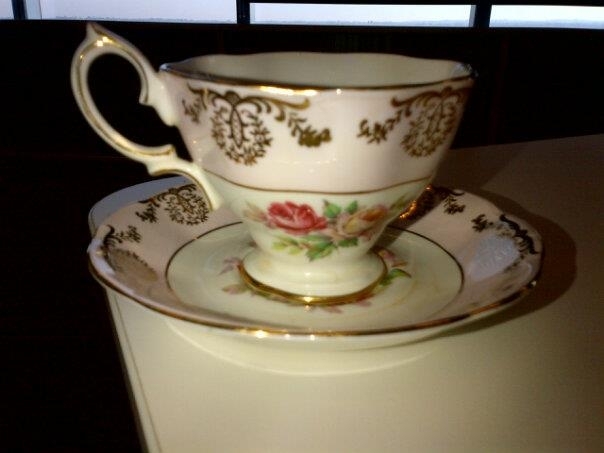 Tea in a pretty cup can make any day seem better! After a weekend of lying flat in bed with a head cold, I took a sick day from work on the Monday. I had blissful visions of a restful day in bed, watching TV, napping and recovering, when Bookworm theatrically announced he was sick as well and needed a day off school. May I just say I have not actually had a weekday sick day where I get to rest without looking after children for ABOUT EIGHT YEARS NOW. I would like to say that I lovingly put my own needs aside and then proceeded to fluff his blankets and organise homemade chicken soup, but the sad truth is I think I slammed the door and yelled a little bit. Fortunately, I spotted the gigantic huntsman spider on the car door BEFORE I opened it to get in. But I still had to run screaming for a broom, bash the spider off the car and kill it before it slunk away and planned a counterattack. I HATE spiders. Even though the whole ordeal was probably only a minute or so, I felt the aftershock all day, and spent a great deal of time frantically brushing non-existent spiders off my shoulders as I drove. Sometimes it really is the small things that count! Today I bought sports bags. I know it doesn’t sound exciting, but there is more to this story. I sometimes feel like the grand narrative of my life is actually a Quest to be Organised. I get really excited when I discover a system or product that I am convinced will magically change my disorganised mess into neat, labelled, easy-to-use orderliness and thus revolutionise my entire body, mind and soul. I was discussing this with a colleague today and she too confessed to harbouring the errant belief that boxes would somehow redeem her household disorganisation – and yes, I have to admit I’ve been there. Sadly, after spending hundreds of dollars on plastic crates of all colours and sizes from the Reject Shop, all I have really ended up with is a stack of broken plastic in the garage after the kids played Pirate Ships in them one too many times. Wicker baskets have been another trap for me. I spied them in a catalogue and was immediately convinced that pretty white baskets lined with pink-and-white or blue-and-white striped cloth inside would save the world (or mine at least). Now, of course, they are stained with texta and have old glue stuck to them and got chewed by the cat and one had a cup of coffee spilled on it and there seem to be five dedicated to old pens that don’t work anymore. Tupperware parties are the worst. I was seduced by those green-lidded Smart Series containers with little air valves that allow your vegetables to “breathe”. Last time I looked, the one that is supposed to be for broccoli was being used as a paint container for Little Miss. And yet another one – charts. When the kids were little I had beautiful charts detailing naps and snacks, then as they got older, afternoon playtime and homework time and unpacking-the-dishwasher time. It was all very SuperNanny, the idea being one activity would flowinto another without stress, complaint or argument. Hmm. I’m not even going there. So anyway, this brings me back to bags. After many years of holding out against extra-curricular activities, our family has now embraced tennis (Bookworm and Picasso), soccer (Picasso), ballet (Little Miss) and swimming (all three). After all five of us spent last Tuesday afternoon frantically searching for Picasso’s soccer socks, I decided right then that sports bags dedicated to each activity were a COMPLETE NECESSITY, you know, along with food and water. And so I went and bought them, and feel the Holy Grail of Organisation may indeed, finally, be mine….